The Donnelly Mass Spectrometry Center (DMSC) provides tailor-made services for characterization and quantification of proteins (proteomics) and small molecules (metabolomics). The facility operates on a cost-recovery model and operates the instruments at-cost for faculty members of the Donnelly Centre and academic collaborators across Canada. The center is located in the Discovery District in downtown Toronto at the Donnelly Centre. facility manager edyta marcon operating a QExactive HF Orbitrap instrument. Mass spectrometry is a highly sensitive method for the detection, characterization and quantification of a wide variety of different compounds, ranging from peptides to small molecule analytes. In a typical "bottom-up" proteomics workflow, proteins are extracted from a biological sample (cell lines, enriched pull-down, tissue, blood plasma, etc.) and then enzymatically cleaved into small peptides which are amenable to LC-MS/MS analysis. These peptides are then separated using on-line liquid chromatography (LC) and ionized using electrospray ionization (ESI). A high resolution detector is then able to measure mass-to-charge ratios (m/z) of the individual peptides with an accuracy down to parts-per-million (ppm). Peptide sequences are determined using fragment ion scans (MS/MS scans) where peptides are fragmented at the peptide backbone to yield characteristic fragments. One strong advantage of mass spectrometry is the ability to detect and quantify proteins in an unbiased manner, independent of the availability of an antibody as well as the high accuracy of relative quantification. Currently, the facility supports multiple workflows. Whole cell quantitative proteomics allows users to obtain quantitative information about thousands of proteins present in a sample from a single analysis. Accurate quantitation can be performed label-free, using isobaric labels (TMT), or using stable isotope labelling (SILAC etc). This workflow is amenable to cell cultures, bacterial cultures or tissues. Affinity purification followed by MS (AP-MS) allows the characterization of protein-protein interaction partners. Phosphoproteomic analysis uses an enrichment step to enrich for phosphorylated peptides which are then subjected to LC-MS/MS analysis and provide a quantitative, unbiased view of the phosphoproteome. 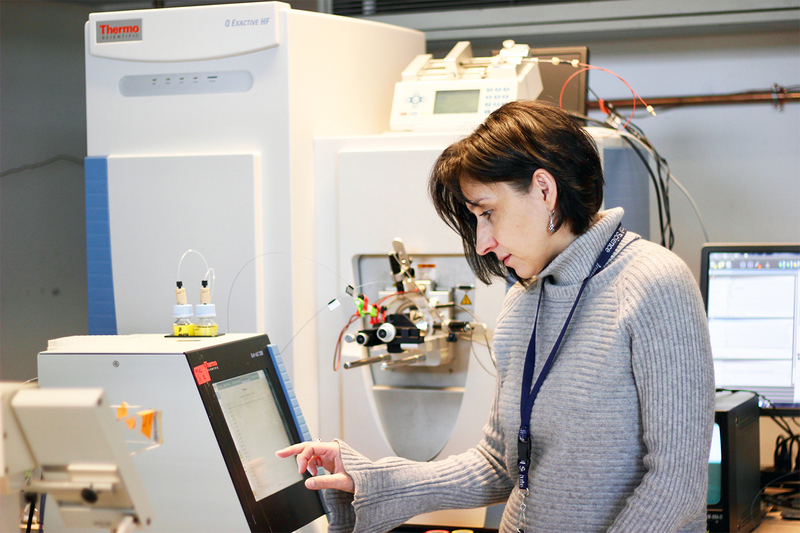 The center houses two mass spectrometric instruments for proteomic analysis (Thermo Scientific LTQ Orbitrap Velos and Thermo Scientific QExactive HF) which allow high-throughput analysis of complex proteomes, metabolomes, PTMS, etc. The center is supported by federal and provincial grants from the Canada Foundation for Innovation (CFI) and the Ontario Ministry of Economic Development, Job Creation and Trade (MEDJCT) and others, which have been awarded to Dr. Jack Greenblatt, Dr. Andrew Emili and Dr. Hannes Rost. If you are interested to run samples at the facility, please contact the facility manager Edyta Marcon at edyta.marcon@utoronto.ca directly.